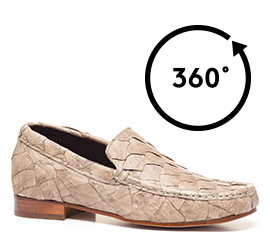 Extremely luxurious and elegant, the "Rua Garcia D'Ávila" are the latest prestigious loafers from the "exotic leather skins" Summer collection 2016 by GuidoMaggi. The upper, hand-sewn is made of noble Piracucu leather skin, special fish from the Amazon. The class and elegance of the refined Piracucu skin, appreciated for the unique shape of its flakes, large and colour changing, give the "Rua Garcia D'Ávila" a freshness that blends naturally with the design of Italian handmade shoes. The insole and the heel with special anti-slip rubber are in genuine Italian leather, assembled and sewn by hand. The immediate increase of 6.5 cm in height combined with an un paralleled growth in self-confidence and a comfortable look, make them ideal for both business meetings and elegant evenings.